New year, new book cover. The cover is the most important tool an author has to sell a book. We’ve all heard the dangers of judging a book by its cover, but it’s amazing how many people do. And why not, anyway? A cover is a split second glimpse into what a story is about. It either captures the nuance of the story (and announces the genre and sets the tone), or it doesn’t. It’s that important. When I first released The River and the Ravages, I thought I’d have a crack at the cover…for a range of reasons (money, schedule, creative impulse…). I had lots of fun working on it, and that was a good reason at the time too. Six months later, embroiled in the complexities of the publishing world, I knew I had to leave the cover in the hands of professionals. So with some spare funds and a new sense of enlightenment on all things book marketing, I approached Damonza requesting to have a new cover designed for The River and the Ravages. Genre has to be addressed in the cover. But the cover also ideally has to go beyond genre. 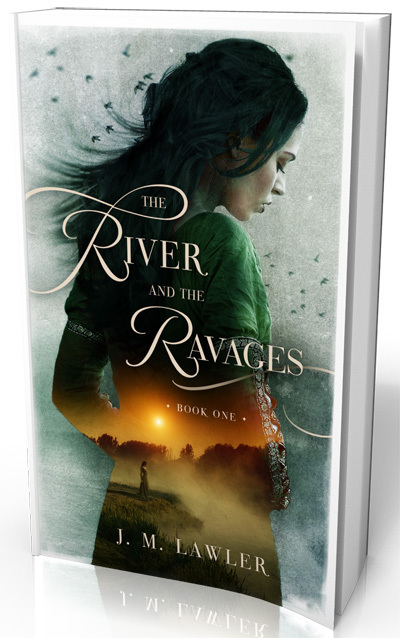 The new cover for The River and the Ravages is a blend of something a little bit fantasy with something a little bit not. Hopefully enough to attract readers of fantasy with a female main character, but at the same time not repelling other potential readers. If the book is part of a trilogy (as is the case with The River and the Ravages), it is essential that the cover of Book 1 is part of a theme that can be adapted and modified, and carried over to books 2 & 3. Somehow the cover needs to promise the reader the main character’s journey is one worth reading about. The style and content of the cover has to reflect the style and content of the book, and the author herself. No easy feat. One image. That’s all you get. The style and content has to be familiar enough so the reader thinks, ‘I’ve read stuff like this before and I quite like it’, but is just a bit more dazzled by the uniqueness of your cover so they think, ‘But this one looks so good I’m going to read it before the fifty other books on my to-read list’. I’m sure you’re appreciating now what a tricky business this book cover business is. When I first saw the cover as a draft I was simply blown away. It WAS The River and the Ravages. It captured it all and more, brought it to life. Aaliya (the main character) looks exactly as I envisaged her, the title font is stunning, and the light near the centre of the cover draws you in. On a final note, from author to reader, I want to say I couldn’t be prouder of the new cover for The River and the Ravages. I think Damonza did a stellar job. I hope you love it as much as I do. Beautiful cover. Thank you for sharing some of the process with us.